​Does the Secret Life of Pets Include Green Gorilla’s New Pet Care ‘Hemp & Olive’ CBD Product Line? We hope so! Just what do our pets do in their secret lives? We think that Green Gorilla’s new “Hemp and Olive” CBD Pet Care products can help them maintain health and happiness... And what pet doesn't want that? Green Gorilla www.ilovegreengorilla.com Co-Founders and Co-CEO’s Steven Saxton and Philip Asquith have announced a new lineup of CBD Pet Care goods as part of their growing 'Hemp & Olive' product line. Green Gorilla's flagship line, Hemp & Olive features the highest quality CBD Oils, CBD Cosmetics and now, CBD Pet Care products. Hemp & Olive's products are ALL 100%: Organic, Non-GMO, Vegan, Plant-Based, Paleo, Kosher, Gluten-Free, Sugar-Free, and THC-Free. All Pet Care products in the Hemp & Olive line are made with 100% Pure Cannabidiol, extracted from Organically Cultivated & Non-GMO Hemp, and purified to its natural crystalline state. Green Gorilla’s CBD is then infused into 100% Organic Extra Virgin Olive Oil, sourced from Award-Winning, boutique California producer, Ojai Olive Oil. Pure CBD extracted from hemp is the healthiest, safest and highest quality Cannabidiolavailable. Extra Virgin Olive Oil is the healthiest, safest, and most effective way to deliver CBD to the body. Beyond being the healthiest option, olive oil also has synergistic effects in combination with CBD and is also able to deliver the CBD to the parts of the body that need it most. 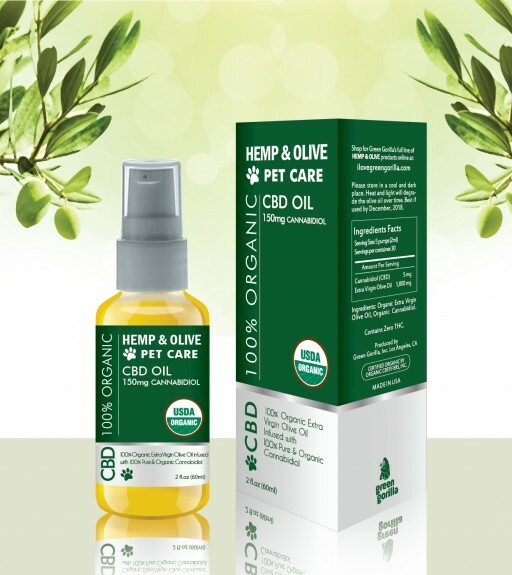 Hemp & Olive's Pet Care CBD Oil is actually identical in every way to our human-use CBD Oil. What we give to our pets is the exact same supplement that all of us at Green Gorilla take every day, so you know we take our pets and your pets very seriously. Pets are an integral part of many families, and we feel that they deserve the same quality of care as we would want for ourselves. At Green Gorilla we are committed to giving pets just that, and to making them as healthy and happy as they can possibly be! Various concentrations of CBD are available in the H&O Pet Care line, including 150mg, 600mg, 1500mg, & 3,000mg of CBD. The pet CBD Oil supplements are packaged in identical 2oz bottles with micro-dispenser tops as our human CBD Oil come in. All of our products contain Zero THC, and have no psychoactive properties whatsoever, so you know your pets are safe from any negative reactions to a psychoactive substance. Product shelf life is 2+ years, and it should be stored in a cool & dark place, as heat, light, and air can all degrade olive oil over time. Green Gorilla Co-Founder and Co-CEO Philip Asquith commented, “I'm thrilled to announce the launch of this this new Pet Care line. My family has lost two dogs to cancer, and I now have another with a serious autoimmune disorder. Creating this pet care line was something near to my heart, as I searched for the best possible treatments for the various ailments of our beloved animals. I believe that these products have made an enormous difference in the lives of my current pets, and also in the lives of other animals we have around my farm. While these products are designed for cats and dogs, they are already also being used for horses, goats, pigs, birds, reptiles, and more. All animals have receptors for CBD, so it stands to reason that all of them can get similar benefits from this remarkable plant extract.” Green Gorilla’s Steven Saxton added, “All humans know, almost instinctively, what’s best for our favorite furry companions. And at Green Gorilla, we believe that secretly, all pets want Green Gorilla's CBD Oil in their lives. I for one am excited to have this for my own pets, and to make it available to all our friends with pets in need." Any product related statements have not been evaluated by the FDA, and our products are not intended to diagnose, treat, or cure any disease. Always consult your own physician before beginning a new dietary supplement program. All Green Gorilla products contain zero THC, and are produced and sold in compliance with US federal law. About Green Gorilla: Green Gorilla is building an international brand in the hemp and cannabis industry. Our mission is to provide sustainable and ethical goods and services to a broad range of customers, with a primary focus on health and wellness. Green Gorilla prides itself on being a sustainable and ethical company, utilizing hemp to provide people with tools to live healthier and happier lives, while also preserving and protecting our planet. While federal policy is developing, the Company will operate only in areas that are unequivocally federally legal, and is initially focused entirely on hemp based products. The company is building a multitude of market leading product lines centered on hemp and the picks and shovels of the cannabis industry, as well as a state of the art web portal addressing a wide range of related goods, services, online interaction, and education. Green Gorilla was established in 2013 by founders Philip J.P. Asquith and Sir Steven Saxton. Prior to his new role as Co-Founder & Co-CEO of Green Gorilla, Inc., Philip J.P. Asquith co-founded and managed Green Monkey, a health and wellness company operating a chain of studios and wellness programs in southern Florida. Mr. Asquith also founded and managed Green Capital Investments, Inc., a structured finance group operating in the renewable energy space. GCI’s projects included wind-energy farms, biomass-energy facilities, and municipal waste-energy facilities. Mr. Asquith is 39 years old, and lives in Ojai, CA, on a certified organic permaculture ranch where for generations his family has produced an award winning extra virgin olive oils under Ojai Olive Oil, Inc. Ojai Olive Oil has been recognized as one of the world's top olive oil producers countless times, and Mr. Asquith awarded the title of “Master Miller”. With over 30 years of experience, Sir Steven Saxton is a successful serial entrepreneur and film executive with credits that include Lone Survivor and The Kids are Alright. He is a highly regarded expert in corporate structuring, private equity, public companies, corporate refinancing, and capital rising for startups. Mr. Saxton has been the lead negotiator for numerous partnerships, mergers, acquisitions, IPO’s and rollups for private and public companies. Mr. Saxton was a former investment banker and stock and commodities broker. Mr. Saxton, the Co-Founder, and Co-CEO of Green Gorilla, is 52 years old, and currently resides in Malibu with his wife and daughter.